Huddah Monroe: 'Buy Yourself A D!ldo And F**k Yourself If Your Man Is Cheating On You'! Kenyan socialite and former Big Brother Africa hotshot Huddah Monroe is back at it again with her controversy. 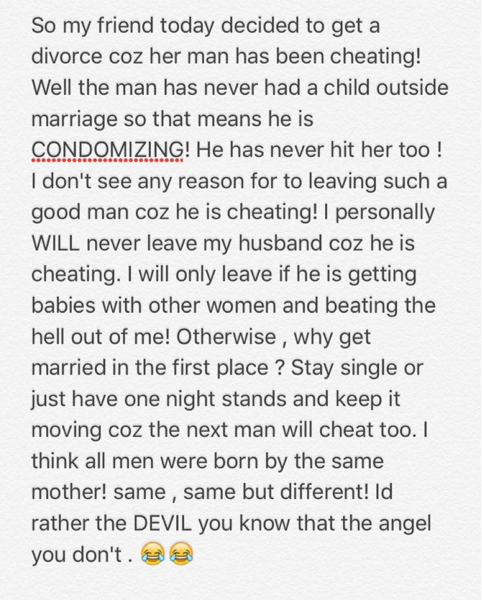 This time round is going candid about her thoughts on cheating and divorce and tells women their is nothing like a good man and no woman should leave her "good" husband because he cheated… at least she wouldn't! The socialite goes further to tell women to either stay single or get d!ldo and satisfy themselves or just stay single because the next man will definitely cheat on you as that how men are born. "These are my thoughts. What's yours ? I posted this for the comments LMFAO! If you don't want to be cheated on , buy some d!ldos like Waiguru and f**k yourself coz the next man these days is like the first . Or Stay with him and use protection or leave and stay single , that's upto you . The ratio of Woman to man is 3-1 and there's Too many hot gals out here, he won't cry a river for you my dear ! You are allowed to call me all sorts of names . I know REALITY is too harsh for most of you! LOL! It's 2015 going on to 2016 , someone needs to remind you of these things! #Tutabanana #PapaHapa #LetsJustBeHonest #LetsJustBeReal" she added salt to the injury.